Getting ready to cast off anchor and head out on your new boat? Don’t leave shore without a VHF DSC marine radio. A VHF radio may be your only lifeline in an emergency, the only means you have of reaching and receiving assistance. Going out on the water isn’t like going out on a drive. Even in relatively remote areas, if you go down on the side of the road, someone will likely eventually drive by to help you. That simply isn’t the case at sea. If you need help finding your first marine VHF radio, check out our comparison chart below. You can shop in your budget and cross-compare features for the best marine radios. 1 What Is a Marine Radio? 4 Do I Need a License? What Is a Marine Radio? Simply put, a marine VHF radio is the must-have communication device for safety at sea. With a marine radio, you get a talking range between five and 50 miles, and the fastest possible access to the Coast Guard and other rescue agencies. You can also use your marine radio to chat with other boats, check weather alerts, and communicate with bridge or lock operators. Generally speaking, you do not need a license to operate a marine radio in the U.S. This is the case aboard all “voluntary ships,” i.e. recreational boats. If you operate commercially or internationally however (cargo ships, commercial fishing, tow boats, etc. ), you do. If you have a marine radio which includes DSC capability, then you will have to acquire a nine-digit maritime mobile service identity (MMSI) number. This number facilitates search and rescue operations by the Coast Guard. Most importantly, marine radios facilitate rescue far more effectively than cell phones! You can only call one person with a cell phone. With a marine radio, you can call everyone in range. Those who hear your signal can home in on your exact location—unlike with a cell phone. You now know the basics about VHF marine radios. Let’s discuss fixed-mount and handheld radios in more depth! A fixed-mount radio can transmit on anything from one to 25 watts of power. Transmitting on one watt allows you to talk to nearby boats without disrupting other transmissions. Transmitting on 25 watts will maximize your range (anywhere from five to 30 miles, depending on clear line of sight). Whereas you can get up to 25 watts with a fixed-mount radio, you are limited to six watts with a handheld radio. You can boost your range by mounting a larger aftermarket antenna. Stand as high on your vessel as possible and you will get the best results. You will usually get around three to eight miles in range. 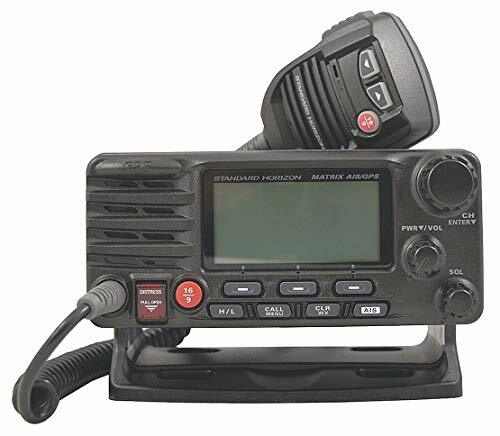 DSC stands for “Digital Selective Calling.” It is one of the most important emergency features for marine radios, and has actually been built into all fixed-mount units since 1999. You’ll also find it in many handheld units. With DSC, you can send out a distress call to the Coast Guard and all other DSC marine radios in your area with the push of a button. Connect your radio to GPS and you can transmit your exact location. This is very important! Many people never do this, and are wasting a potentially life-saving feature of DSC. There are two main scanning features to look for. With Dual Watch, you can watch both your priority channel and a second channel while you await a signal. Tri Watch is similar to Dual Watch, except you can watch three channels at once: your priority channel, channel 09, and any other channel you choose. The main benefit to these scanning features concerns a regulation which forces mariners to monitor Channel 16 on a consistent basis in case someone in distress sends out a Mayday. With Dual or Tri Watch, you can watch this channel and any others you want to use. This feature is designed to screen out background noise, improving the clarity of both incoming and outgoing transmissions. This is particularly important at sea, where many loud noises regularly occur—waves crashing, engine noise, high winds, rain, etc. IPX1: Protection from some vertical drops. IPX2: Protection from vertical drops and drops when the device is tilted up to 15 degrees. People like the HX870 because it makes them feel safe when they’re out on the water. With its built-in GPS, this radio can detect your position and automatically send it out to a rescue team if you run into trouble. Another great thing about this marine radio is that it is super easy to find if you happen to drop it in the water at night. The strobe light automatically turns on. The HX870 floats, so it’s easy to retrieve. Popular on Amazon. 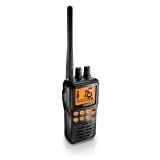 The HX870 recently made it to the top of Amazon’s marine radio bestseller list. Sends your GPS coordinates. If something happens to you while you’re out, this radio makes it easy to get help. Large sized display. The HX870’s huge 2.3” display is huge for a marine radio. Intuitive menus. You don’t need to read the manual because the interface is logical and easy to use. Strobe light clicks on if it falls in the water. If a sudden wave knocks this radio out to sea, just look for the flashing light and scoop back into the boat. 100% waterproof. This radio is JIS8 certified. That means that it’s submersible and totally waterproof– not just water resistant. Noise cancellation. The HX870 automatically eliminates annoying static that makes it hard to understand what the person on the other end of the transmission is saying. This radio is lightweight, but it’s also large and bulky. If you’re looking for a marine radio that you can easily clip to your belt, you may want to go with a different product. The device itself is waterproof, but the charging cradle is not. The charger will stop working if it’s exposed to water. Cobra is a big name in the world of communication devices, and with high-quality devices like the Cobra MRHH350FLT Floating VHF Radio, it is no wonder why. This radio is buoyant and waterproof, and features a number of other excellent benefits which make it competitive with more expensive models. Waterproof and floats. This devices has an IPX7 rating, so it can be submerged in as much as three feet of water. It also is designed to float. Up to 6 watts of power. You can operate the MRHH350FLT on several different power settings: 1, 3, or 6 watts. This gives you the flexibility to balance range with battery life conservation needs. Noise cancellation. This device does a great job canceling out background sounds so that you can transmit clearly. The GX1700W costs twice as much as an ordinary mounted marine radio. But, it has twice as many features. With this unit you get built in GPS and DSC. Plus, water doesn’t phase it. This radio is JIS8 certified waterproof. Won’t break if submerged underwater. The GX1700W can withstand being submerged in water for up to 30 minutes. It’s JIS8 certified. Water damage guarantee. Standard Horizon is so confident in this radio that it has backed it up with a 3 year warranty that covers all water related breakages. 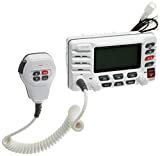 This product is expensive compared to other marine radios. The built-in speakers are clear but not very loud. The Standard Horizon GX2200B, also called the Matrix AIS/GPS GX2200B, is designed for the key purpose of making AIS as easy as possible. The unit succeeds, and does so brilliantly, while also providing users with a number of other handy features and great all-around ease-of-use. It is an excellent choice for beginning and advanced users. Easy AIS. This marine radio comes equipped with two built-in AIS receivers as well as an integrated GPS receiver with 66 channels. Once you take care of the initial installation (which is fast and easy), you should be able to get AIS acquisition working right off the bat. Helpful manual. As just mentioned, installation is a breeze. This is thanks in part to the design of the radio, but also is due in part to the clear, detailed, helpful manual. A lot of radios lack good manuals, so this is a real plus. Great customer support. StandardHorizon offers great customer service and can be relied on when you need them. Lots of awesome features. This marine radio comes outfitted with all the fantastic features you could ask for, including 4800 or 38400 NMEA baud rate selection, programmable alarms for collision avoidance, an IPX7 waterproof rating (which makes the unit submersible), a noise-cancelling speaker microphone featuring ClearVoice technology, and more. There is even an optional Voice Scrambler. The screen is a bit small and tricky to read. Most users probably will not be bothered by this, but some may. You’re welcome, Randy! Always happy to be of help. Thank you for providing this information for our readers who might be traveling or living in Canada. That is why we avoid Canada at all cost and that extorted 50.00 per person class/permit to navigate Canadian waters. You would think Canada would have earned plenty of money already from the water ways from your mass butchering of the walleye and other game fish. Christine, the best fresh water boating in all of North America is in Georgian Bay, Ontario. And the best brackish water boating is in the Saint John River. This is heaven, and i don’t mind the license issue. In the US the FCC will issue a “RESTRICTED RADIOTELEPHONE OPERATOR PERMIT” with no requirement for taking any course or passing any test. It is in conformance with Geneva Regulations 1987. When I got mine there was no charge. Thank you for sharing this information. That is very helpful to us and to our readers to know. Check on the fees Canadians pay to fish etc in these united States before you gripe. Bet it’s more.